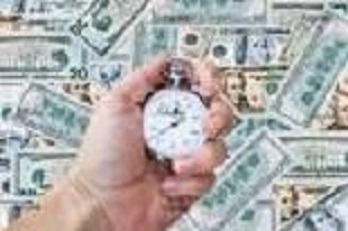 Stock Market Price Timing, includes more than stock entries and stock trading exit strategies. It also includes astute Money Management, which will dictate whether or not you can make a trade on a particular stock you are interested in. The first goal of stock market price timing and money management is to ensure survival. You need to avoid risks that can put you out of business. The second goal is to earn a steady rate of return. And the third goal is to earn high returns...but survival comes first. "Do not risk your whole trading account! "...is the first rule of trading. Losers violate this by "betting" too much on a single trade. Then they continue to trade the same or even a bigger size during a losing streak. Or they can on a lucky roll and start to "bet" their winnings away. Good money management can keep you out of the hole in the first place. You have to know in advance how much you can lose and when and what level you will cut your loss. Amateurs try to get rich quick but destroy themselves by taking wild risks. They get killed by either emotion or ignorance. Amateurs act on hunches and stumble into trades that they should have never taken. If you focus on handling losses, profits will take care of themselves. So, how do you manage and insure your money doesn't disappear due to a couple of bad trades? If you bet 25% of your account on each trade, your ruin is guaranteed. You will be wiped out by a very short losing streak, which happens even with the very best trading systems. Even if you bet 10% of your account on a trade, you will be eventually broke. According to Dr. Alexander Elder, in his book Come Into My Trading Room: A Complete Guide To Trading, extensive testing has showed that the maximum amount a stock trader may lose on a single trade, without damaging his long term prospects is 2 percent of his trading equity. 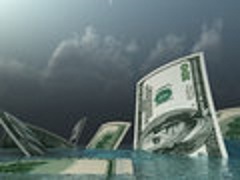 This stock market price limit includes slippage (the difference between estimated transaction costs and the amount actually paid) and broker commissions. So if you have a $10,000.00 account for trading, the most you can risk or lose is no more than 2%, or $200 on a trade. Oh oh, let me guess, you have a small trading account and the 2 percent rule just threw a monkey wrench into your dreams of quick profits. You know what? Most successful stock trading professionals consider 2% to high. So if you have a small trading account, be very, VERY careful. This 2% rule keeps you out of riskier trades, which can dictate your stock market timing on a particular stock...you may not be able to trade it at all. This is known as Position Sizing. What stock market price will you buy at? This is based upon the trading system you are using. What is your potential profit target? - what price you expect your stock to move to and in how long. Again, your trading system should determine this. Determine your initial stop loss - at what price below your buy price will you exit the trade if it goes bad. Quite often, traders will use the latest minor support level. From this stop-loss, how many shares can you trade in order to keep within the 2% rule? ie. If you have a $10,000 trading account, the most you can risk or lose would be $200.00. So if the stock in question is at $10.00, and you initial stop loss is determined to be at $8.00, that would be a potential $2.00 loss. $200.00 divided by $2.00 is equal to 100 shares maximum you can buy. Is the risk/reward ratio at least 3 to 1? This is determined by dividing the potential target price appreciation, by the potential stop-loss price depreciation. ie. If your stock is currently at $10.00, and your trading system dictates the price going to $16.00, an appreciation of $6.00. You initial stop-loss is $8.00, a loss of $2.00...$6 divided by $2 is a risk/reward ratio of 3 to 1! 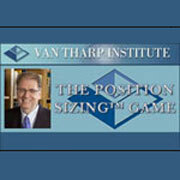 A great resource to master your stock trading Position Sizing skills is The Position Sizing Game by internationally renowned stock trading coach Dr. Van K. Tharp. This is a unique learning tool as it is a Trading Simulation Game...you learn while having fun, which is the best way to learn! This game will answer the question “How much?” through position sizing strategies, as well as you learn how to let your profits run—and protect them as well. Playing the game using your own system’s results in simulation mode allows you to practice proper position sizing methods for your own trading. 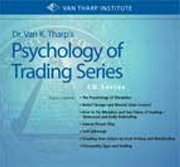 Trading simulation helps you develop the discipline to follow the other two keys for trading success. 4. using position sizing strategies to make sure you have a low-risk trade. The Position Sizing Game is designed to drive these principles home by giving you the experience of making (or losing) money in a game environment where losing is safer. Through the game, you begin to understand these stock market price timing principles experimentally without having real money at stake. Designed for all levels of investors and traders! Treat Your Stock Trading Like a Business. Transform Yourself Into A Super Trader! 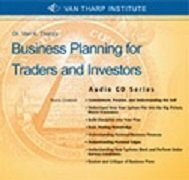 Return from "Stock Market Price Timing" to "Risk Management Plan"
Return from "Stock Market Price Timing" to the Home Page: "Stock Market For Beginners"